I'm a bit late with this one, after all the CD was released on Islay last year. 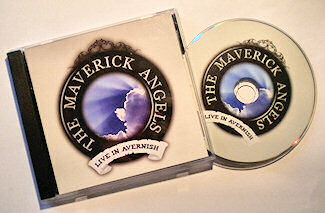 During my Islay visit in June I finally got round to buy the Maverick Angels CD, called ‘Live in Avernish’. Wish I had bought it earlier, it's a great little CD! They call it ‘Celtic / Folk / Experimental’, performed with flute, pipes & whistles, box and guitar. The CD contains 7 songs, all written by the band members themselves. As far as I'm concerned all lovely tunes, some happy and faster, other more solemn and quieter. It's difficult to pick a favourite, at a push I think I'll go for the opener, ‘Rd.’. What's the link to Islay, apart from that the CD was released on the island? Well, at least one member lives on Islay, Fraser Shaw. Regular readers might remember him, I've mentioned him before (seen here playing an Irish reel). He can often be found in the Port Charlotte Hotel, either serving behind the bar or making music. The other band members are John Somerville, Inno and Kevin O'Neill (couldn't find a MySpace page for him and am not sure where he's from). Now where to get the CD? I don't know if and where it is available on the mainland or on the internet, all I know is that it is available in a variety of places on Islay. I bought my copy at the Kilchoman distillery visitor centre shop. Your best bet is the Port Charlotte Hotel though, with a bit of luck you can even buy it directly from Fraser there.